Nick Saban said there was a plan for Bryant-Denny Stadium’s turf and Saturday morning, you saw part of it. After battling unfavorable field conditions last week, the Crimson Tide brought it air support. 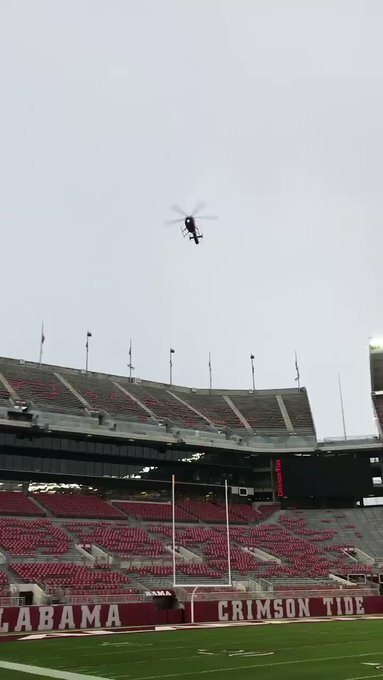 A video posted Saturday morning by athletics director Greg Byrne showed helicopters flying low near the playing surface to dry the field after heavy overnight rain. Alabama kicks off with Auburn at 2:30 p.m. CT in the Iron Bowl. Rain leading up to last week’s 50-17 win over The Citadel left the turf in rough shape. Players were slipping all over the place with divots from goal line to goal line. "Yeah, we did have quite a few slips,” Alabama receiver Henry Ruggs III said. “Coach (Josh) Gattis mentioned after warmups that the field is not the best this week, so we had to focus on our footwork, and eventually in the game the grass got the best of us sometimes." Saban on Wednesday said there’s some burden on the players themselves.